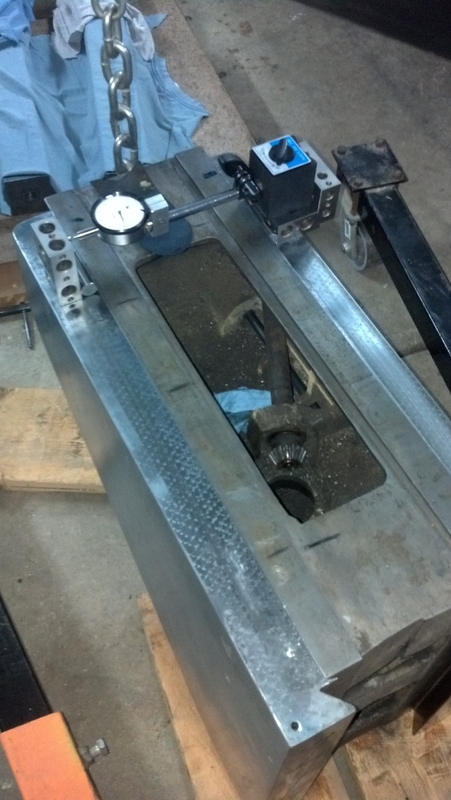 This project started with a Bridgeport Series I machine with a frozen knee. The previous owner made several attempts to free the knee before giving up. He tried to push the gib up from the bottom but just broke pieces off. He also tried to drill and tap a hole in the top of the gib to pull it up but this broke the top of the gib off leaving the rest stuck down inside. So after sitting in his shop for several years it was finally given to me because it was "unfixable". 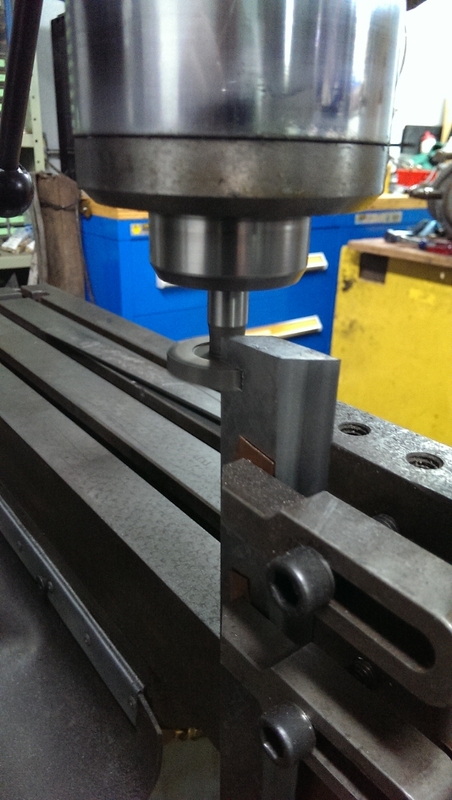 My strategy was to machine a piece of steel to fit the ways and apply upward pressure on the broken point of gib sticking out of the bottom. 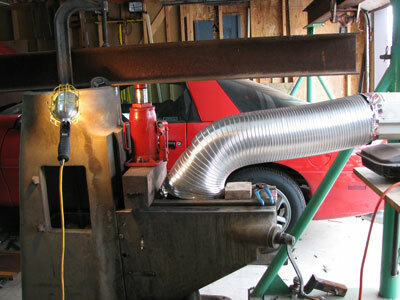 Next I took my shop heater and ducted hot air into the center of the knee. I also filled the column up with snow. using a 20 ton jack I applied downward force on the knee. After enough even heating I was finally able to get the knee to move. 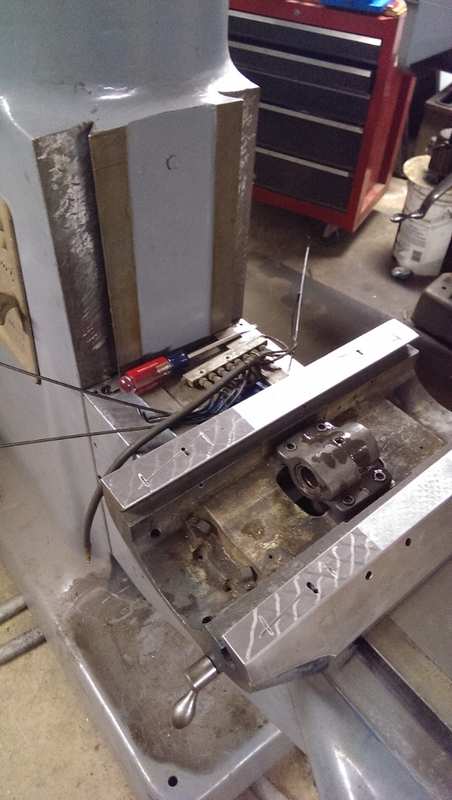 I was using my CNC milling machine to make the the new gib but the Heidenhain TNC151 on the machine died in the middle of the job. 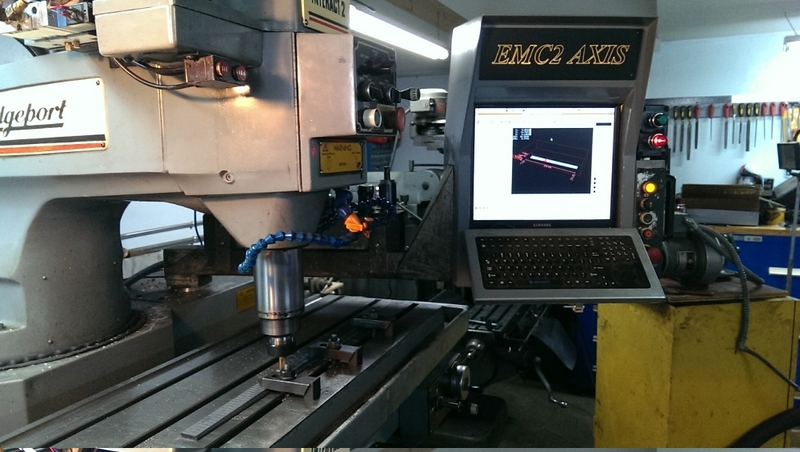 See Bridgeport Series II for more detail on the CNC milling machine repair. 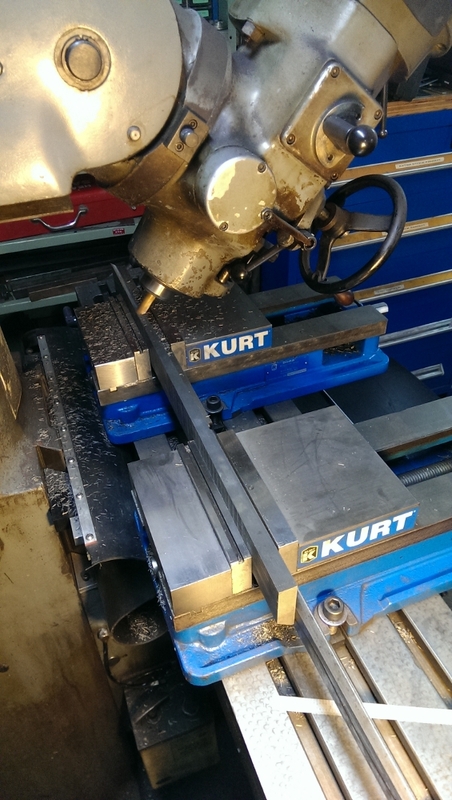 I eventually finished the new gib by milling the new one close to the same taper as the old one. I used a chain hoist to raise and lower the knee so that I could apply prussian blue to the ways check the gib and then scrape. This process was repeated until the new gib made good contact over its entire length. Making and fitting the new knee gib. The knee gib started from a new gib that I purchsed. It was way to thick at first. 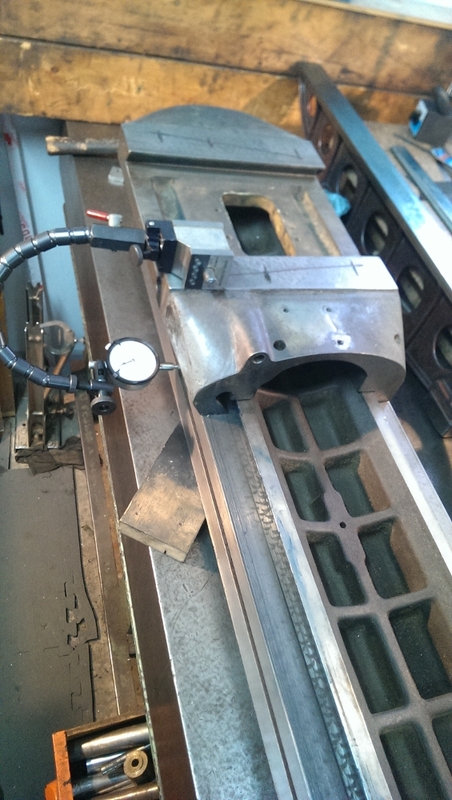 It was milled thinner using the Series II CNC mill. After fitting the knee and Knee gib I worked on the saddle. Unfortunately I don't have images of all if the work. 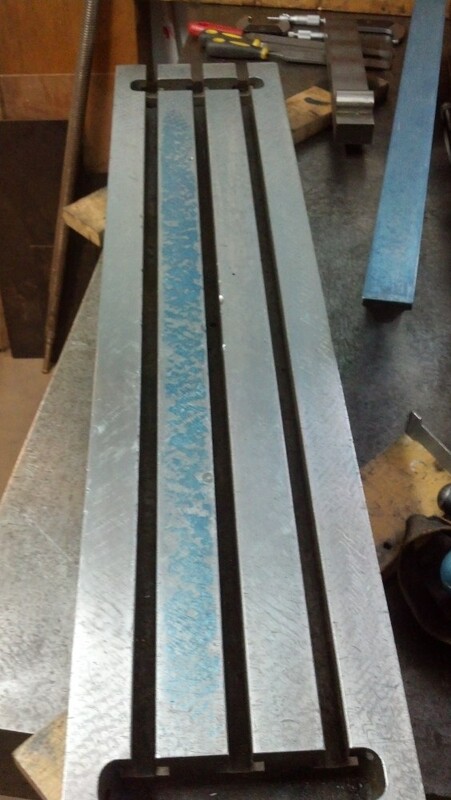 To ensure the top and bottom ways were flat and parallel I placed a 24" X 24" surface plate on my surface grinder then slid the saddle on the surface plate taking very small cuts until the ways were flat and parallel. Only a very small amount of material was removed. The top of the knee showed more wear in the middle but the chrome plating was not worn through. With the the knee gib tight the saddle would bind if moved to the front or back. I used a small grinding disk i a right angle die grinder to carefully remove material in small amounts like you would do by scraping. I always use a respirator for these kind of dust making activities. The original gib for the saddle had been shimmed and was too short. 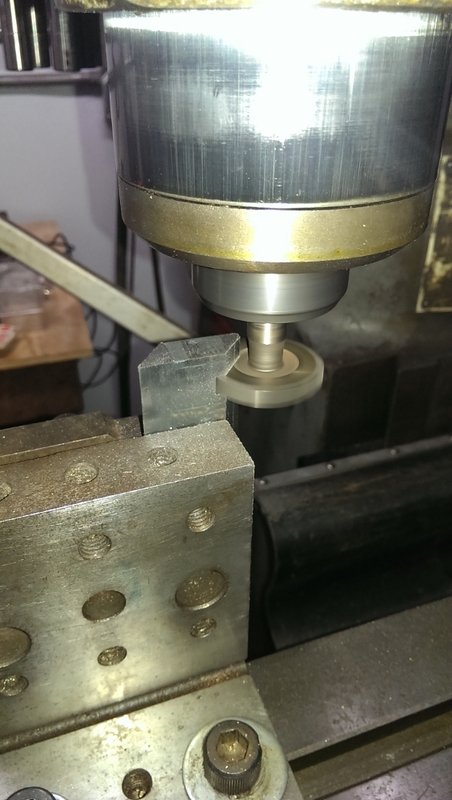 Rather than buying a new gib and machining it smaller I decided to make a new one from a bar of cast iron. Most bridegport tables will develop a crown from end to end. A machine builder told be this is from years of clamping using the T slots. 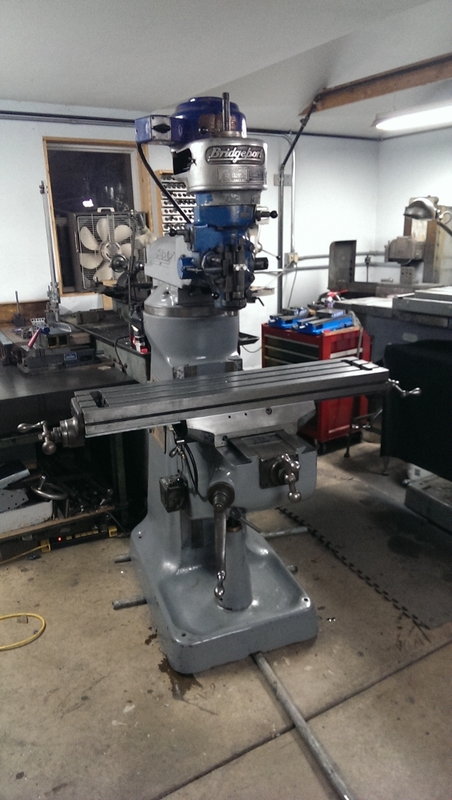 I checked my other series I manual machine with a 42 inch table and sure enough the table is about 0.002" high in the middle. Rather then spend $500 plus to have the table ground flat I decided to try to scrape it flat. This one was about 0.003" high in the center. I used a 36" Brown and Sharpe straight edge. After scrapping the first section flat by hand I decided that this was too much work and was ready to abandon the whole project. About 1.5 years later I was able to borrow a Biax power scraper. with the power scraper I was able to finish scraping the table flat. After getting the top flat I flipped the table over and scraped the ways. I use my straight edge and a micrometer to measure the thickness along the ways from the table top surface to the ways. The saddle movement and indicated accuracy against the table side was checked. The original table gib was also shimmed and too thin. The shim was blocking the oil holes so a new one was needed. 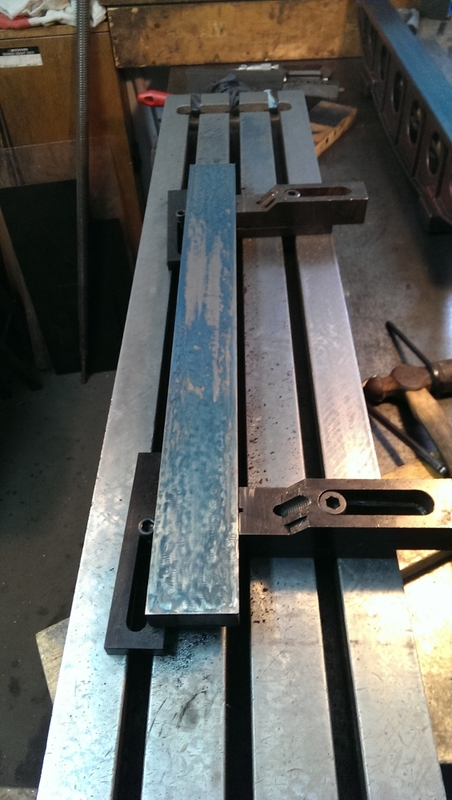 To make the gib a bar of cast iron was milled to approximate thickness then I straighten the part and scraped one side flat. 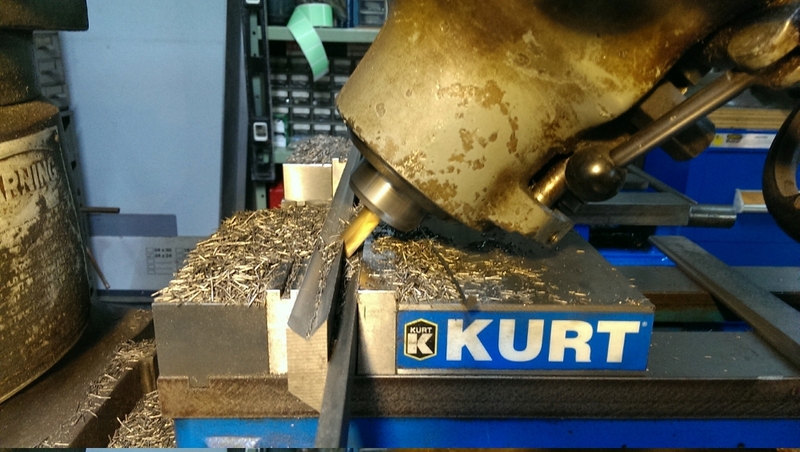 I used the CNC to machine the tapper. 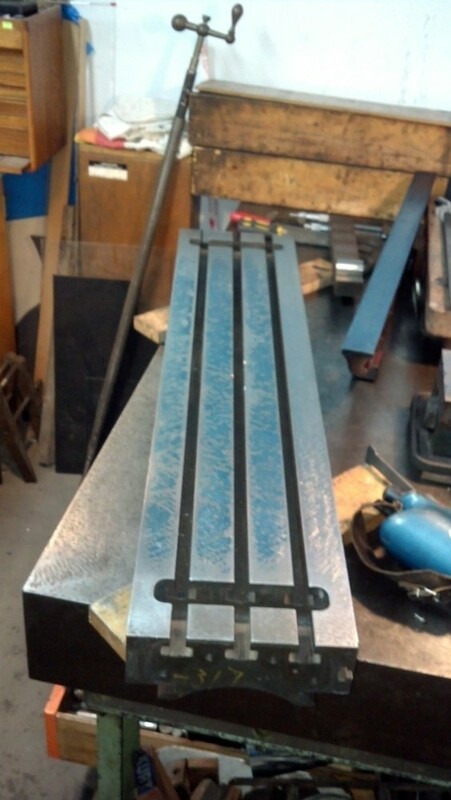 Long thin parts warp when machined to it is important to clamp the part in multiple places. 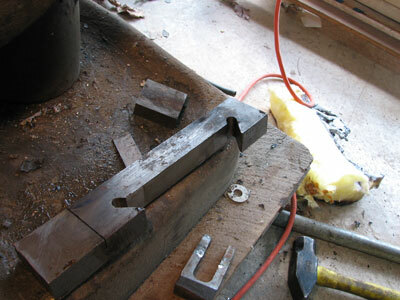 To straighten, I use a dull wide chisel to cross peen the gib. 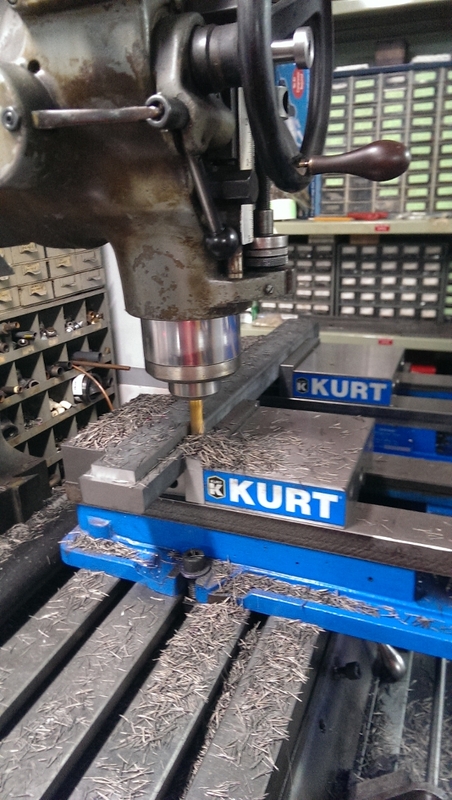 The straightening technique was shown to me by a professional machine rebuilder. 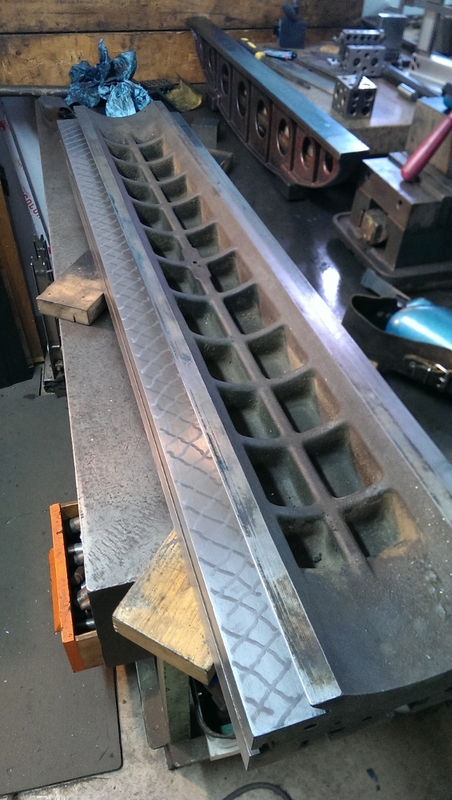 Before a gib can be scraped, the side that does not slide against the ways must be perfectly flat. Otherwise the gib will just bend flat each time it is inserted and it will mark in the wrong places. 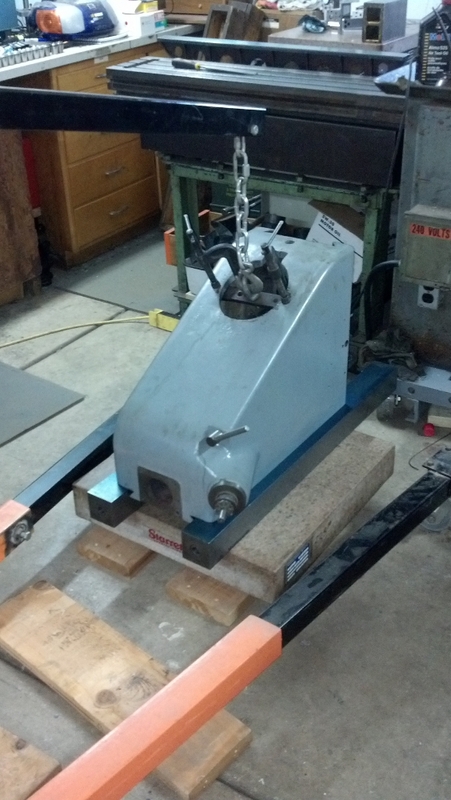 To machine the taper the clamps must be moved multiple times to keep the gib flat against the table. 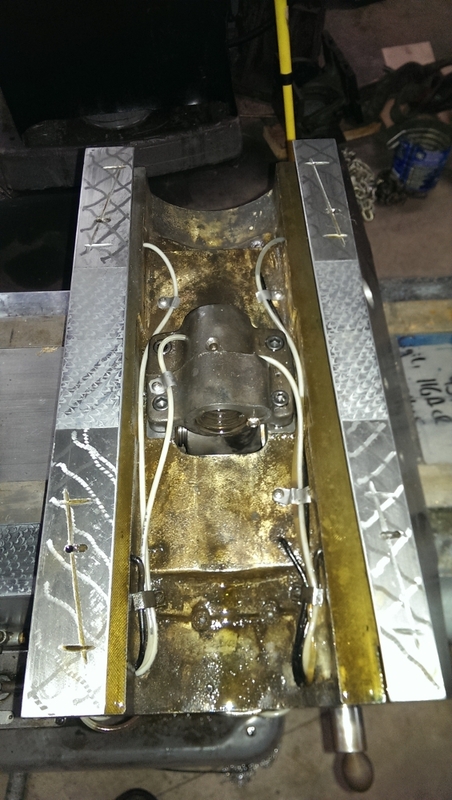 During final assembly I found a number of the oil metering orifices plugged. Maybe that is why the knee froze? Some oil lines needed to be replaced. I spent way too much time on this. It was done a little at a time over a period of 6 years. I estimate about 120 hours. In the end I have a "tight" and accurate machine.